Prime. 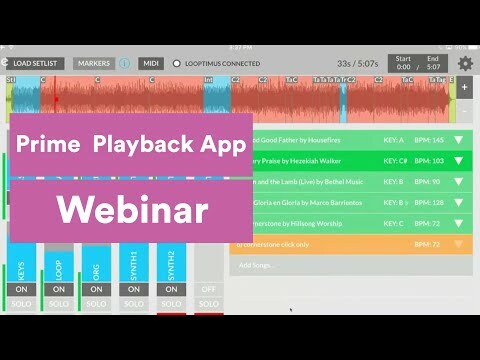 Free app for backing multitracks. I've missed this and I find it will be useful for those who play backing tracks. It can handle your own music in addition to their "credit for track" model and even let users sell their tracks. It requires login into their cloud system (drawback for someone) but it has all the best ideas of song arrangers (audio like soltron/ketron) with transpose (keyshift) and bpm (timestretching). I saw this before but it won't let you add anything unless it goes thru them I think? Filed under non-secular. It's the sort of thing I actively avoid. Yes, all the songs are upload using their cloud. Sorry I'm not sure if I understood you properly... Are you talking about the background community? Yeah, check the website. From memory, when the app was released it had more references to that. That part seems to have been removed from the store description. It isn't usual these communities share their musical knowledge and resources since they "trainning students for serve to the Lord in their churchs" (I was just talking about it few days ago with a friend who teach music in Evangelic congregation) and not for others uses BUT it seems that this app aim is a bit open since you can find popular music and even rock (xD). Also my friend talked to me about this topic without problem and answered all my questions. It seems it's possible to ask for upload wishlist songs and so on. Seems legit to me but I just found it today and tried the demo song. I will upload a song to test a bit more. Finally upload a song made with BlocsWave and work as expected (with minor drawbacks). It could be the perfect companion even without expend a buck and forgiving about workship music debate. Worth a look as backing tracks app IMHO.